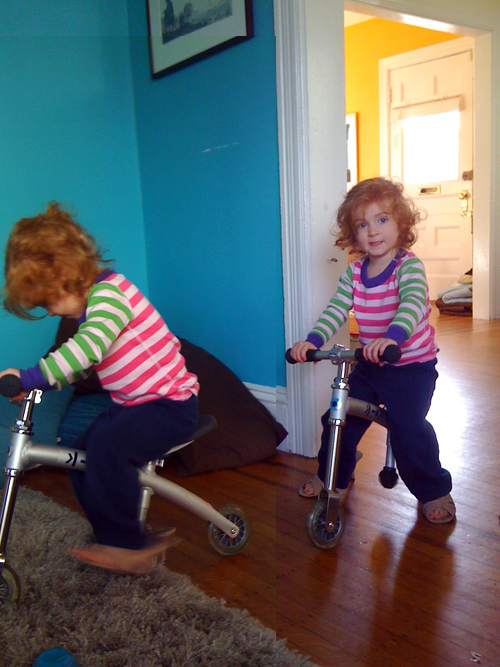 The kids have been riding balance bikes since May. Took them a few months to want to try them and some time after that to get past frustration, but now they tear around the house with their feet in the air. G’s been walking in her mother’s heels. A few days later she got on the bike with them. The carpet hardly slows her down. She may be Dutch. That is just fantastic. Kids come up with the darndest things to do! Just kidding. Awesome stuff! Nice to see kids are still having good old school fun!